some organic sugar or slice of brown candy. 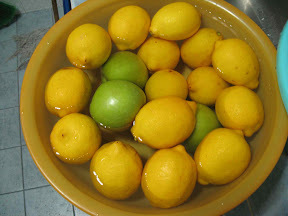 The quantity for lemons, fruits and sugar are almost the same. Wash the fruits and let air dry it. Wash the jars, knife, chopping board and air dry it. Make sure that everything are clean and dry without water, to prevent contamination, growing mold or bad bacteria. Peeling the fruits and cut them into pieces. 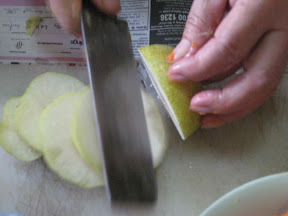 Lay one layer of fruit slice in the jar, one layer of lemon slices, one layer of sugar. Repeat the process until the jar is full. Remember to cover the last layer with sugar. 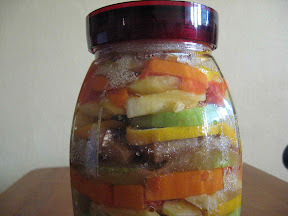 Close the jar tightly and leave it at a corner without direct sunlight. Do not put in on the floor. From time to time, about every 2 days, shake the jar lightly to ensure that the fruits and top part of the bottle are immersed in liquid to prevent mold growth and let the bubbles out. Let the fermentation goes on for another 2 - 3 weeks. 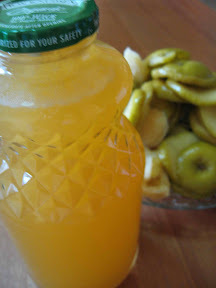 Separate the fruit from liquid and transfer the enzyme into new clean glass bottle. Wish you having a good health! 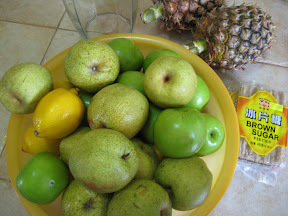 Following is a video taken to show you how to make fruit enzyme. Hope this will help you to do it yourself at home. If you prefer to read this article in Chinese, you may refer to How to make fruit enzyme in Chinese here! If you like to know more about us, feel free to visit our homepage at Asia TCM.